yeah, she actually told me to “bug off”. we had been knitting in the den, talking about recent medical events and her understanding of what happened. i know i am tired and emotional and hypersensitive because i am offended. i also know this territory from years of experience. i shut down. i was silent. i quit talking and attempting to engage in conversation. i quit watching her, quit reading the environment. i quit listening and paying attention. i left her alone, put on a non responsive, passive, happy face while she put on lipstick and jewelry, spraying hairspray everywhere but towards her head so that we could go to the dining room for dinner looking good. after days of caregiving. after hours in the middle of the night in the emergency room and days driving to and from the hospital. after going here, then there, over there, then back again at the ring of the cell phone. after listening to someone pontificate from ignorance comparing an intestinal bleed to a valve in a hydraulic leak. after figuring out she meant chow mien not spaghetti. after sharing doctor recommendations to drink more water and eat more fruits and vegetables, and no, orange juice does not meet that criteria. and after the crazy making response that exercise and new underwear will resolve pain issues, i heard those words spewed towards me. i am bugged. i am sad. and i want a mom. those words came at the end of the day. the end of a very, very long day of cleaning and preparation, organizing and getting ready. my mother came to spend the day, good friday ~ to make way for Easter Sunday brunch with the family. she brings her dog who doesn’t really like my dog. my husband leaves before she arrived. her husband leaves as soon as he can. maybe they know something we don’t. we are left with just us, the dogs and the mess of my house. she is 83 years old. she has had a stroke. she doesn’t always make much sense with her words. she is stubborn and creative and excited as a 4 year old about this coming holiday. in oh, so simple words, she talks about maundy thursday services at her church. how the pastor led the service on her knees ~ washing feet, giving communion, sharing the story ~ from her knees, a place of humility. tears come easily as she reflects on the meaning of Lent and the Easter miracle of death and resurrection. she is touched somewhere deeper in her soul than she even knows. and it get all mixed up in her own service and hope that we will have just the right place to celebrate. so we begin the ritual preparations. she has not “deep cleaned” or entertained since her stroke and she is on fire. she begins in one corner of my messy kitchen, removing everything from the counters. “where is your caddy?” (i don’t have a cleaning caddy…once i understood the question.) this is not going to be a simple clean. this is going to be “wash the windows with ammonia and newspaper” kind of clean. this is going to be “take everything out of the refrigerator and disinfect” kind of clean. this is going to be “get on your knees to wash the floor” kind of clean. mix in endless reminders of how tidy and organized and clean my brothers are right next to the stacks of cardboard boxes in the living room corner and christmas decorations still on top of the hutch and i begin to spiral down, to say nothing of feeling exhausted because i can’t keep up with her excitement and frenzied cleaning pace. all of my preconceived ideas and lifelong experiences show up. all of them are based on our history together ~ i live in a messy home. which means i must be a messy person. which means i can’t in anyway appreciate beauty or order or the finer things in life. see how easy i fall into a lie? a lie that i tell myself. she hasn’t told it to me. i have told it to myself, over and over. my mother only wants to help make my home beautiful for a sunday celebration. so i begin to watch her with new eyes, maybe a new perspective, with an intentionally open heart. in her childlike way she is so pleased with this day. 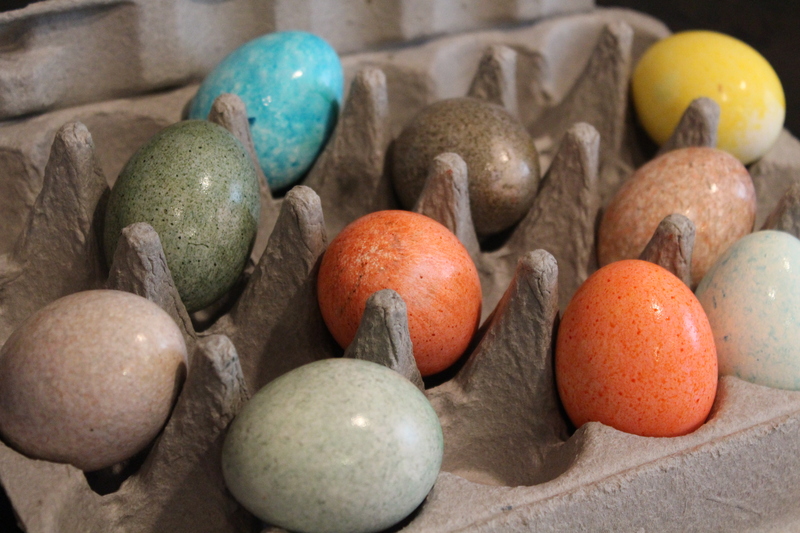 she finds ceramic ducks and bunnies, a plastic lamb and little egg bowls. 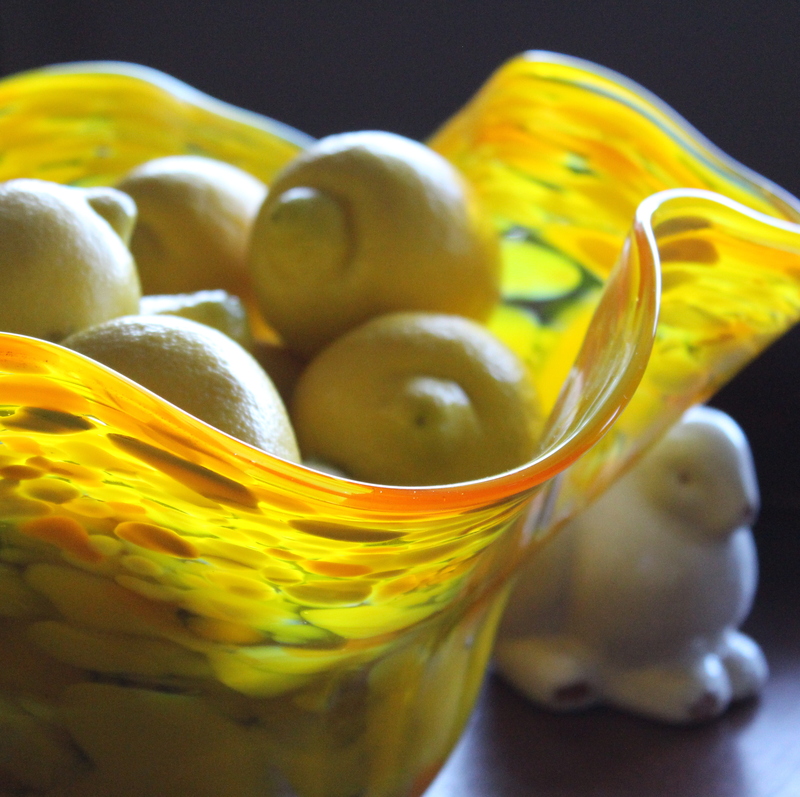 she finds a huge yellow bowl and fills it with lemons. she sends me out to pick lilacs to put in the yellow vase. she polishes the granite and washes the floor. i wash the windows, inside and out and then vacuum and move furniture. i find chairs and dishes. i cannot find the linen tablecloth and i don’t own linen napkins. she agrees to the paper napkins from IKEA. “they will do” as she traces the bird with her fingers. exhausted, she sits on the couch. i serve her a cup of ginger-lemon tea, cantaloupe ice-cream and a cookie as she looks over the rooms, content and happy. these are the things that bring meaning to her and i can almost hear her purr. at the end of the day she reminds me to polish the silver. 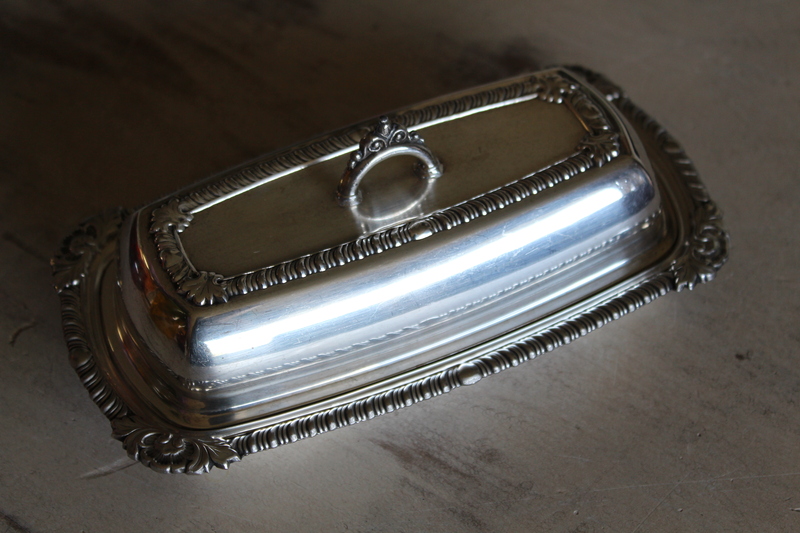 polishing the butter dish brings tears to my eyes and memories to my heart…. the first polish was with some “liquid” that i dipped each piece of silverware in and it miraculously shined. it smelled like rotten eggs. i sent the silverware through the dishwasher and it came out the color of my car. i should have polished the way i was taught. new polish was purchased. the sink was filled with warm soapy water and layers of aluminum foil. 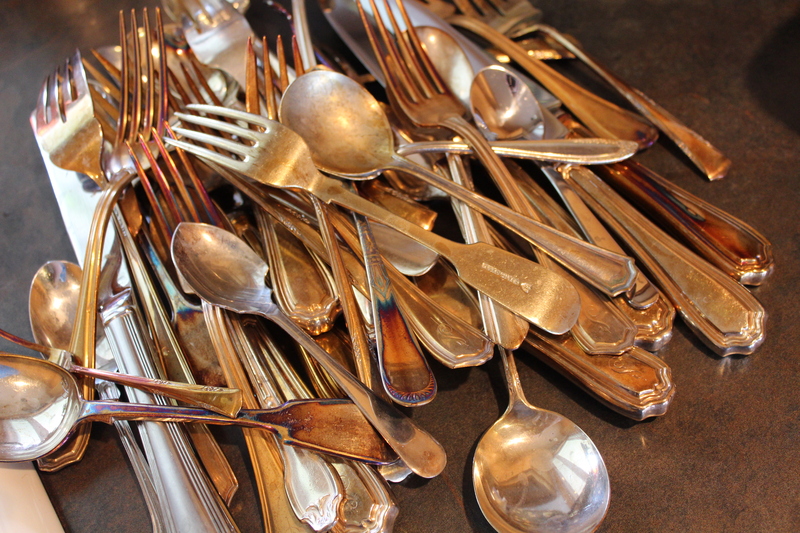 one by one, fork by fork, spoon by spoon, each one handled and buffed with the gentle sponge and cream. and now they are ready to be set next to the china plates, the cut glass goblets and the paper napkins with birds.